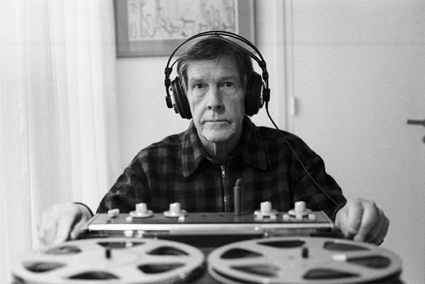 The music world has pretty much thrown a year-long party for John Cage’s centenary. In Australia we’ve already seen significant celebrations by Clocked Out with The Cage in Us festival at the Judith Wright Centre in Brisbane (see preview and review). In Adelaide, composer Stephen Whittington presented a day-long celebration which included an eight-hour performance of ASLSP (As Slow As Possible) played on the Elder Hall pipe organ (see article), while Perth-based ensemble Decibel has, on several occasions, undertaken the massive challenge of performing all Cage’s Variations (see realtime tv interview with Cat Hope). Now a major Sydney celebration will feature acclaimed US ensemble Bang on a Can All-Stars and our own Ensemble Offspring (see realtime tv interview). Presented by the Sydney Opera House as part of their Composer series (the first earlier in the year featuring Steve Reich), the mini-festival runs over two days, exploring Cage’s work and his legacy in four concerts and a lecture. The festival begins with John Cage and his American Descendants performed by Bang on a Can All-Stars featuring two of Cage’s seminal mid-career works, Indeterminacy and Variations 2. Following will be pieces composed by Bang on a Can founders Michael Gordon, David Lang and Julia Wolfe along with clarinetist-composer Florent Ghys, exploring the direct influence of Cage’s work on the ensemble. The second concert The Music Of John Cage and Brian Eno will feature excerpts from Cage’s Improvisations, Sonatas & Interludes complemented by a special live arrangement of Brian Eno’s Music for Airports. Brian Eno, through his music, writing and cross-artform exploration is arguably one of the only contemporary composers to even come close to attaining the guru-like status granted Cage, so this juxtaposition seems apt. 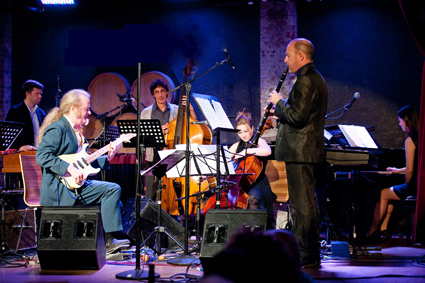 In Permission Granted we will see Bang on a Can team up with Ensemble Offspring to further ride the ripple-effect of Cagean philosophy—beginning with the work that changed the world, Cage’s 4’33, which famously features three sections of non-playing, focusing on the actual sounds of the world around us with time as a framing device. After this aural cleansing the audience will be treated to works inspired by the kind of freedom 4’33 espouses, Dutch composer Louis Andriessen’s Workers Union, Australian composer (and student of Andriessen) Kate Moore’s Ridegway and US composer Terry Riley’s hypnotic minimalist classic In C.
No Cage celebration would be complete without a Musicircus, a cacophonous explosion of simultaneity and chance as multiple Cage pieces are performed together “on traditional and non-traditional instruments, with and without choreography” (press release), the actions dictated by the I-Ching, dice and coin tossing. This musical happening will be wrangled by Ensemble Offspring with a range of guest performers. There is also a lecture and panel discussion led by Lyle Chan, a composer and musicologist (who is also, according to his website, a personal development coach and chrematist—someone who makes money via speculation and exchange rather than labour). In Lecture on Nothing, the title of one of Cage’s philosophical dissertations, Chan will explore “Cage’s conceptual practice, personal life and the way that they intertwined, influenced and created his creative legacy” (press release). Perhaps the talk could be followed by a screening of the Duchamp-Cage film excerpt Discs from the 1947 Hans Richter experimental feature Dreams That Money Can Buy? Bang on a Can All-Stars will also be performing in Melbourne presenting the Australian premiere of Field Recordings on November 5 and the Melbourne premieres of Eno’s Music for Airports plus David Lang’s sunray and Julia Wolfe’s Big Beautiful Dark and Scary on November 7. Field Recordings is Bang on a Can’s major new project, featuring nine newly commissioned works by Tyondai Braxton, Mira Calix, Florent Ghys, Michael Gordon, David Lang, Christian Marclay, Todd Reynolds, Julia Wolfe, and Nick Zammuto, formerly of The Books.